Since the inception of NOAA's exploration program in 2001, OER data management has been guided by the 2000 President's Panel Report (pdf 16.8 MB) recommendations which prioritized rapid and unrestricted data sharing as one of five critical exploration program components. More recently, Public law 111-11 [Section XII Ocean Exploration] (pdf 1.26 MB) reinforced and expanded OER data management objectives, continuing to stress the importance of sharing unique exploration data and information to improve public understanding of the oceans, and for research and management purposes. Data management practices are also informed by NOAA Administrative Order (NAO) 212-15 Management of Environmental Data and Information, and by the Procedural Directives developed by the NOAA Environmental Data Management Committee to coordinate policy implementation. The volume, diversity and uniqueness of scientific data and information collected during ocean exploration activities is extensive, and presents a unique data management challenge. An interdisciplinary data management partnership between OER, NOAA Data Centers, the NOAA Library and extramural partners formed a data management task force to ensure that the scientific data and information resulting from NOAA's exploration program are documented and widely accessible. This group began with an assessment and documented a systematic workflow, resulting in an overarching, "End-to End" (E2E) approach toward managing exploration information throughout the data lifecycle. Since that time, data management tools and techniques have been developed to implement this E2E approach. These methods are available for review and are exchanged with the broader community, including the NOAA Environmental Data Management Committee (EDMC), the NSF Rolling Deck to Repository (R2R) Program, the Integrated Ocean and Coastal Mapping (IOCM) Program and the related the NOAA R2R initiative. The Cruise Information Management System (CIMS) is a workflow based data entry system that aggregates cruise planning information and produces Data Management Plans, ISO metadata records, and data management metrics. 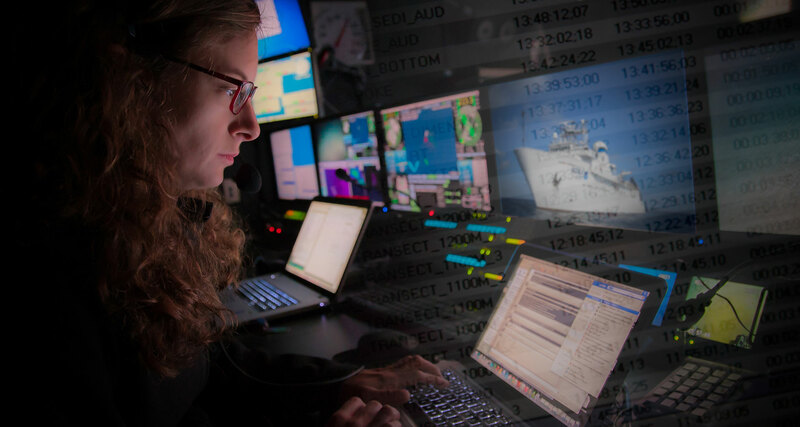 CIMS also integrates with to specialized systems including geospatial databases and systems for large-scale metadata record production for both bathymetry and video data collected on board the NOAA Ship Okeanos Explorer. The NOAA Central Library curates the OER document, video and image data collection, providing both online and onsite access to these important data assets. The Library also maintains an OER bibliography and provides a measure of the value of exploration to research through analysis of the citations of peer-reviewed publications resulting from ocean exploration. The OER Digital Atlas presents a holistic view of OER expeditions in an online map. The Atlas map interface is a simple-to-operate Esri ArcGIS application that indexes the complex array of distributed information links that are uniquely associated with each cruise. Information is added to the Atlas interface over time as data quality control measures are completed, data are released, and publications, lesson plans and related materials are published. A data request form enables the public to submit specific requests for assistance in locating or accessing data that are not found online. OER data are also directly available from the NOAA National Data Centers and from the data.gov geospatial data portal. Operational data management aboard the NOAA Ship Okeanos Explorer presents an optimal example of end-to-end data management, as defined by national and NOAA policies and international standards and as implemented by the OER data management task force. This exemplar is the result of the unique relationship aboard the ship, which relies on the close alliance between the exploration mission objectives and the ship's unique capabilities. On the Okeanos Explorer, data management marries with telepresence technology to ensure rapid, standardized management of exploration data assets. For more information, read A Hybrid Approach to Data Acquistion and Management (pdf, 1.5 MB). The shipboard repository server (SBRS) gathers data from shipboard acquisition systems into a standard data file structure, using standard file naming conventions. "Warehousing" the data in this way enables optimization of data quality assurance and documentation processes and supports rapid data throughput to data centers for preservation and stewardship. A subset of data and information products created on the ship are moved from ship to shore via the ship's satellite connection to a shore-side repository server (SRS), which mirrors the SBRS. The SRS supports near real-time access to data for shore-side science participants, as well as public access to a subset of data and products through online maps and the NOAA Office of Ocean Exploration and Research website. Multidisciplinary scientific data sets have been fully managed since the ship’s commissioning in 2008. Quality controlled data from Okeanos Explorer cruises, including bathymetry, water column and sea floor backscatter, remotely operated vehicle (ROV) dive locations and video, meteorological and oceanographic data from shipboard sensors, and summary reports are publically accessible from the Digital Atlas after a QA/QC and processing period of 60-90 days. When the ship is underway, the Okeanos Explorer Atlas offers a near-real time view of Okeanos Explorer operations when the ship is at-sea. The ship position, ambient conditions, and data products generated aboard ship are periodically updated on the map. Post cruise, data are integrated into a geospatial database and provide a retrospective view of all cruises aboard the NOAA Ship Okeanos Explorer. For more information contact oer.info.mgmt@noaa.gov.